If you know me, then you know what my favorite breakfast is. For the last several years I have had some form of english muffin with some form of peanut butter with either half or whole banana. The combo of chewy, crunchy, sweet, nutty, creamy…. it is just a winning combination. Right now my exact favorite combination is a whole wheat english muffin from Whole Foods with their honey roasted freshly ground peanut butter and either half or a whole banana based on my hunger. Last Monday morning, however, we were out of bananas. Bananas are the most important part of my breakfasts! There was no need to panic. I had a big bowl of normal sized apples (why are apples so huge these days??) that I got from Whole Foods- sourced 75 miles away. I sliced one up and topped my english muffin and peanut butter with it. Delicious. Rather than being sweet and creamy like the banana topping is, the apple added that fresh crispiness that only apples can provide… as well as an almost tart flavor. I loved it and will be making it part of my regular breakfast routine. Sometimes it is actually a good thing when we run out of our favorite ingredients because we are forced to experiment and find a new winning combination! I am excited for breakfast tomorrow (no bananas again) as I am going to eat this combo again! 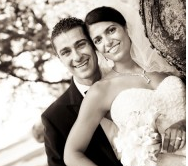 – Diran & Rita’s amazing Manhattan wedding! I think you right, I usually create interesting dishes when I’m low on food and trying to use the last of everything. Sounds like you’ve got a lot of things to look forward to this week! How exciting!! I haven’t made this in a while, but I love a toasted English muffin, sliced apples, then sharp cheddar over the top and put it under the broiler – holy yum! Happy Monday – looks like you have a great week coming up! I need a banana in the morning! It just sin’t right w/o it. I once got into a figh with my old boyfriend because he ate my last banana. OMG i faaahhreeak if I’m out of bananas in the am!! Mostly bc you can’t make the bomb banana oatmeal with out them! I have done the pb + apple and it’s so good, also, strawbs are a great random sub as well! CANT WAIT for the raw banana sort serve test!! I have no idea why all apples (and other fruits actually) are gigantic. Chemicals? I don’t know because even organic can be big and I have to pick through things to get normal sized! Did you go to Josie’s on the UWS? If so, you were in my old ‘hood!